Have you ever read a book about spirituality and felt like, this is great, in fact it’s wonderful, but how does it work for me? I hate to admit it, but it’s true. I read a lot of spirituality books and I feel like often the authors don’t take into account that the readers have lives; 40 hour a week jobs, children with ballet lessons and soccer practice, birthday parties and barbeques to attend. Maybe we can’t incorporate everything, which often times the authors make you feel like you have to do just that. 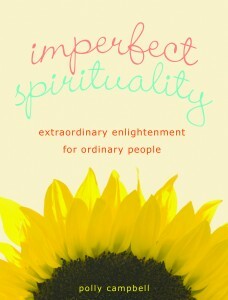 Enter “Imperfect Spirituality: Extraordinary Enlightenment for Ordinary People” by Polly Campbell. Here the book opens with a spiritual allegory that I think most of us can relate to, disciplining a child who has misbehaved. In this case a little girl who has managed to climb most of Mt. Bookcase before Mom noticed. When an angry Campbell goes to talk to an upset little girl who opted for forcible removal, before she can start the little girl wants to know if Mom still loves her even when she has bad behavior. Campbell responds that there is nothing the little girl could do to make her not love her. Campbell wonders why she cannot extend the same compassion and kindness to herself. Why instead of forgiveness does she mentally pummel herself for her errors? Campbell describes learning more about spirituality, applying it, and accommodating it for her lifestyle, all the while dodging raisins flying out of her kid’s nose, doing sing-song rhymes, and dealing with Rheumatoid Arthritis. The traditional spirituality discussed may not be groundbreaking for the more experienced, but Campbell’s unique perspective makes “Imperfect Spirituality” perfect for beginning seekers and seasoned travelers.